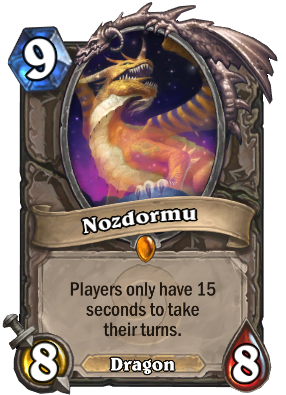 Nozdormu the Timeless is one of the five Great Aspects empowered by the titans (the others being Alexstrasza, Deathwing,Malygos, and Ysera) to watch over Azeroth. He fought against the demons during the War of the Ancients. Following this intervention, he retreated into seclusion, immersing himself in his duties. He emerges only infrequently, when events require his direct presence. He intervened in the defeat of Deathwing at the hands of Krasus and his allies, one of the few times he has been seen in the skies of Azeroth. Hands up if you pulled this guy from the welcome bundle. Maybe he will see play in a meta where combo decks with extremely slow animations (like the Auctionmaster Beardo/Uther of the Ebon Blade Paladin OTK deck) are dominating? I don't know. But it must be funny surprising people by playing him. It may cause them to misplay as well. Not very useful but not that bad either. If they aren't going to rework this into something good, I'd at least like the effect to last for the rest of the game, regardless of if Nozdormu gets killed.